We offer several types of healing, as described in the sections below. Each healing session involves a conversational part, where underlying causes may be discussed, and the hands-on healing part performed while the client is lying fully clothed on a massage table. The hands-on healings operate on the spiritual body, also known as the etheric body, which permeates and surrounds the physical body. 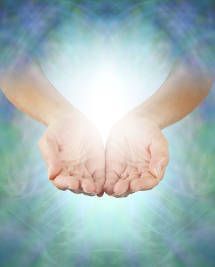 The hands-on healing sessions cleanse and balance the energy of your etheric body. Healing helps you quieten your mind, fill your soul, expand your awareness and ultimately find your purpose in life. You will leave our healing space feeling better than ever before. The session durations given below are a guide only - if more time is required there is no extra charge, and no one leaves until they are free of negative energies. Note also that each session is individually prepared, taking half an hour before your session, which of course is at no extra charge. This traditional healing method cleanses and restores the etheric body, removing all negative energies and boosting it with rejuvenating life force. A session lasts between 75 and 120 minutes and costs AUD $150. Note that three sessions are normally required for spirit release healing. Hypnosis allows you to access the subconscious levels of your mind. This is where your thought patterns are programmed, and these are primarily fear based - our subconscious mind is responsible for our protection. In a hypnosis session these programs can be erased and replaced with new programs. The new programs cann be for any thought pattern you want: self-confidence, success, to stop addictive behaviour, etc. A session lasts between 45 and 60 minutes and costs AUD $97. A hypnosis session can be combined with a healing session, and would cost $180 for the combined session. This is a deep relaxation or meditation method. In a state of deep relaxation, the sometimes hidden source of problems can be discovered and remedied. A hands-on healing is also included. Any of the above healings can be booked for a couple in the same appointment. As well as couples, mothers and daughters, siblings, friends and so on can book a couples healing. A session for two people lasts between 90 minutes and two and half hours and costs AUD $250 (a saving of $50 on separate sessions). Any curses which have been placed upon you, in this life or in a past life, can be removed. Note that three sessions are normally required for curse removal healing. Any space can collect negative energies or even be cursed. We travel to your home or business within our service area and clear your space of negative energy and curses. A home or business clearing takes between 30 and 60 minutes and costs between AUD $350 and $600 depending on distance and complexity. This is a shorter session where your energies are balanced and boosted, and can be used as a regular maintenance program for returning clients who have already had a healing with us. A session lasts between 45 and 60 minutes and costs AUD $97. Note that as we do not have EFTPOS facilities, payment is either by cash on the day or via bank transfer arranged in advance. Spiritual Healer, Byron Bay Spiritual Healer, Spiritual Healing, Byron Bay Spiritual Healing, Energy Healer, Byron Bay Energy Healer, Energy Healing, Byron Bay Energy Healing, most powerful spiritual healer, Byron Bay, most powerful spiritual healing, most powerful energy healer, Byron Bay, most powerful spiritual healer, spirit, energy, healing, healer, exorcist, exorcism, Gold Coast Spiritual Healer, Gold Coast Spiritual Healing, Gold Coast Energy Healer, Gold Coast Energy Healing, most powerful spiritual healing Gold Coast, most powerful energy healer Gold Coast Murwillumbah Spiritual Healer, Murwillumbah Spiritual Healing, Murwillumbah Energy Healer, Murwillumbah Energy Healing, most powerful spiritual healing Murwillumbah, most powerful energy healer Murwillumbah Ballina Spiritual Healer, Ballina Spiritual Healing, Ballina Energy Healer, Ballina Energy Healing, most powerful spiritual healing Ballina, most powerful energy healer Ballina Lismore Spiritual Healer, Lismore Spiritual Healing, Lismore Energy Healer, Lismore Energy Healing, most powerful spiritual healing Lismore, most powerful energy healer Lismore. The post code regions serviced by us are 2480, 2481, 2482, 2483, 2484, 2485, 2486, and 4208 to 4228 including 4211 and 4225.